to develop numerical models for solution by the artificial mind , which is the modern computer. general sense, almost all reasonably successful efforts and models, in physics and mechanics, until now, have involved some sort of superposition or imposition of discontinuity on continuity. Then, the available continuum models or theories are very often enhanced or enriched by models or constraints to simulate discontinuity. It is with the foregoing appreciation of the limitation of our modelling that we will deal with materials that are both continuous and discontinuous at the same time. A deforming material is considered to be a mixture of “continuous” and “discontinuous” parts. The latter can involve relative motions between particles due to microcracking, slippage, rotations, etc. 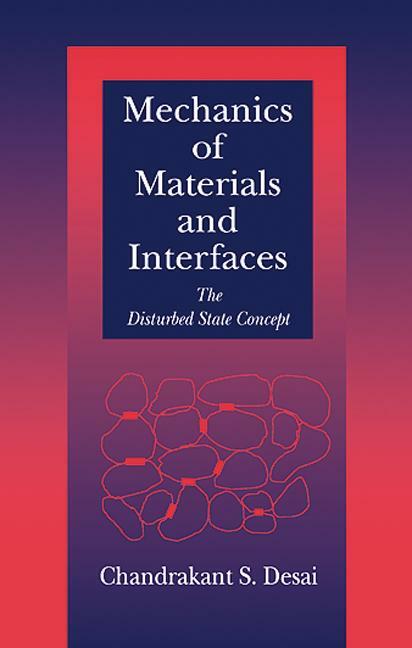 As introduced in the previous chapter, the disturbed state concept (DSC) is based on the basic physical principle that the behavior exhibited through the interacting mechanisms of components in a mixture can be expressed in terms of the responses of the components connected through a coupling function, called the disturbance function ( D ). In the case of the mechanical response of deforming engineering materials, the components are considered to be reference material states. For the element of the same material, the reference material states are considered to be its (initial) continuum or relative intact (RI) state, and the fully adjusted (FA) state that results from the transformation of the material in the RI state due to factors such as particle (relative) motions and microcracking. 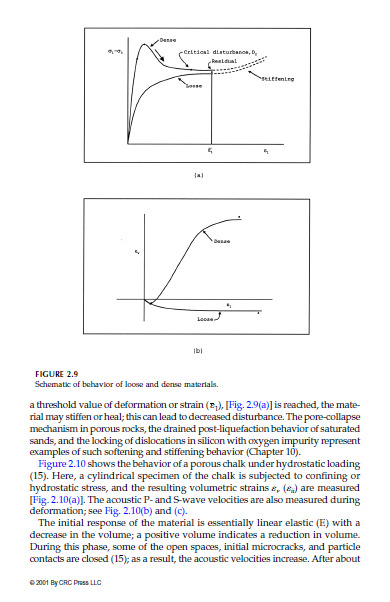 We first consider the DSC for the case of deformations in the same material. 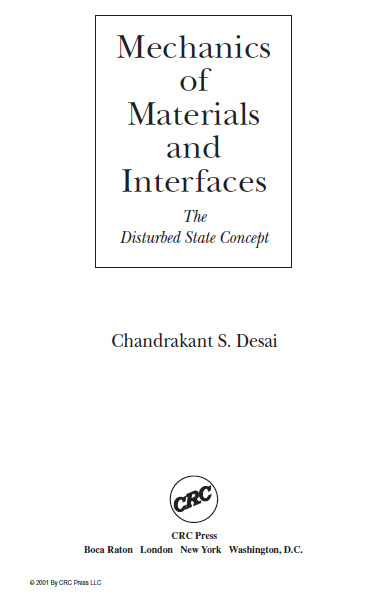 Then we shall consider the DSC for deforming a material element composed of more than one (different) material. density or void ratio (e), does not change significantly during deformation. 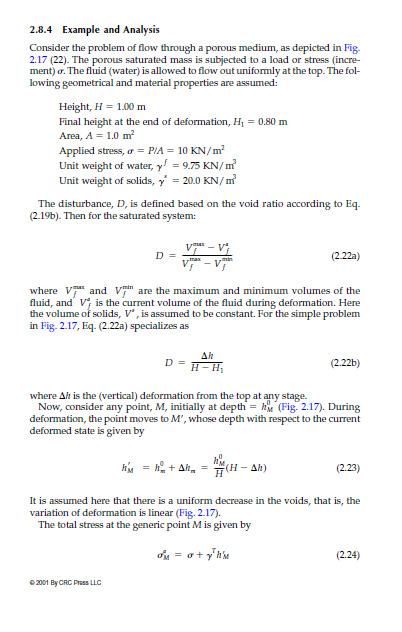 In other words, as in the case of some metals, it is assumed that the density or void ratio of the material remains invariant during deformation. 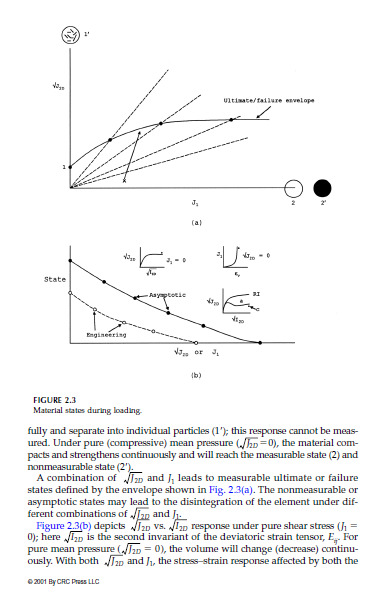 The linear elastic response can be considered to be the RI state in relation to the observed elastic–plastic (hardening) behavior. The elastic–plastic hardening response can be treated as an RI state in relation to the elastic perfectly plastic response. The linear elastic or the elastic–plastic hardening responses can be treated as RI in relation to the observed degradation or softening behavior. inelastic, or plastic strain . Hence, the total strain, , at different points is assumed to be composed of the plastic, , and the elastic or recoverable parts. yielding; however, the stress under continuing loading increases after the yield point. In other words, every point during the loading is a “new” yield point, and the next yield stress is greater than the previous yield stress. Such behavior is called elastic-plastic hardening response.